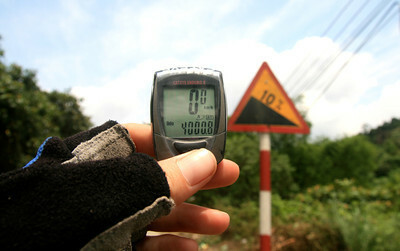 Our bike ride across Vietnam was not very long, but very hilly. The rich diversity of hill-tribe culture was much more apparent than in Laos but it's not always appropriate or easy to capture through photos. 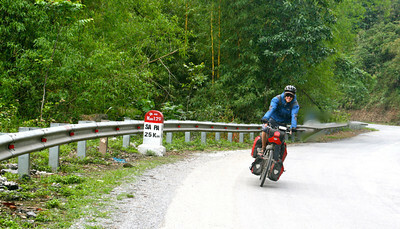 Riding down from the Laos border into Vietnam on a stressfully narrow, pot-holed road with trucks zooming around the blind corners. Photo by Adam Hughes. 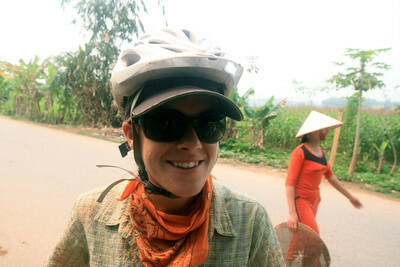 After my crash on my first day in Vietnam (you can kind of see the huge dent/chip in my glasses). They were staring at us so I figured it was okay for me to stare at them too. 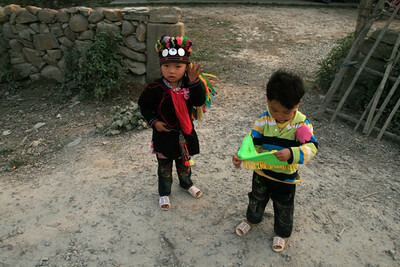 And they didn't seem to mind when I got my camera out to record their techtronically traditional outfits. 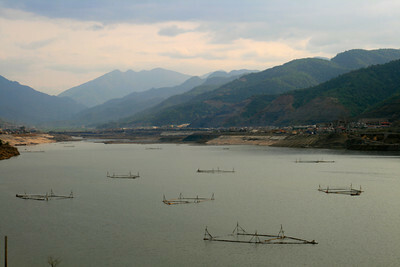 Kind of beautiful, kind of scary: a valley being flooded for a massive hydro-electric dam. To avoid the embarrassment of flooding their provincial capital they just renamed it and assigned the old town's name to some other random small town. Good luck finding the real Lai Chau. 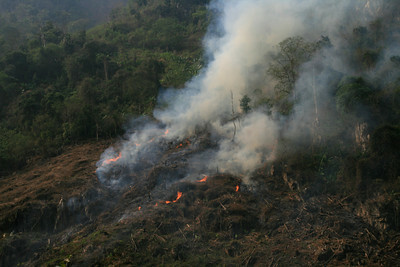 The burning was much more extensive in Laos but we got to see it up closer in Vietnam. March is apparently the season when for some reason they burn their fields and forests - possibly to clear the land for the next planting - but we weren't sure. 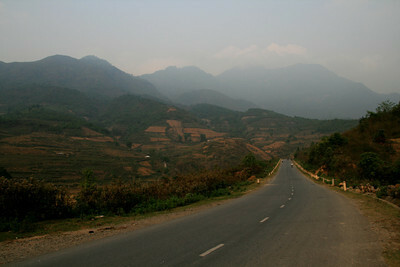 This is kind of the general gist of northwest Vietnam, hills, cleared brownish fields, decent roads without too much traffic. 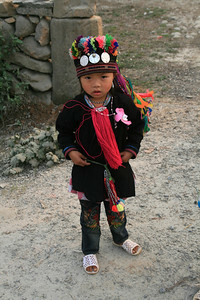 Amazingly, this is just everyday wear in northwest Vietnam. As we biked through I could notice different tribal groups based on their different (crazily colored) dress. I love people watching in these countries, especially while having a hot bowl of 'pho' (noodle soup) for breakfast (and lunch and dinner). 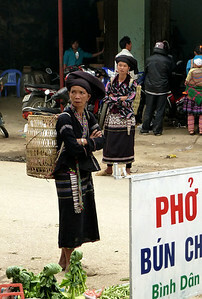 The morning market is a fascinating place to watch the social interactions - and traditional dress - among the different ethnic groups of the hill areas in Vietnam. 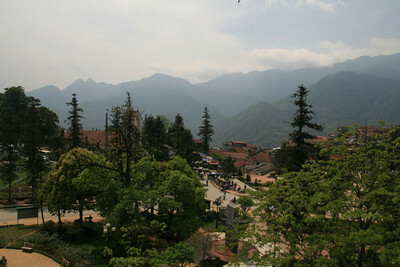 Sapa, a hill station established by the French in the 1920s, on an apparently rare sunny day. It reminded me of French ski resorts in the Alps or Jura. 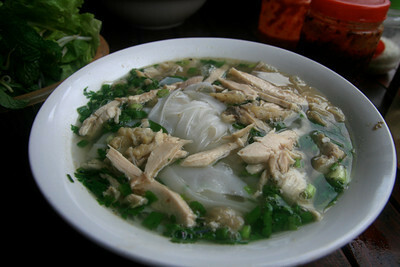 Delicious "pho" - noodle soup with chicken, green onions and mint leaves. Wheeeeeeeeeee! 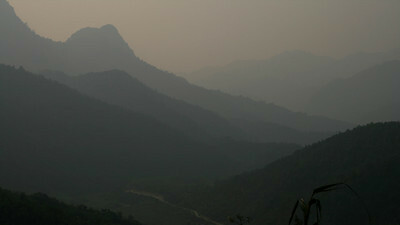 Downhill from Sapa to the border: we're going to Chinaaaaaaa! 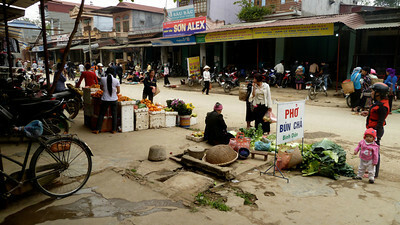 I reached 4,000km on the last day in Vietnam! If you're lucky they let you know that the grade is only 10%. Above that they don't bother.